As a reader of this post, odds are high that you are well aware of the importance of wayfinding signage in your library and how the intersection of signage, space and service has a significant impact on the user experience. This is especially important when using decor elements to reinforce and/or redefine your library’s brand image, and they also function as signage. This planning phase reminds me of the adage, “measure twice, cut once.” I know you’re eager to start “sign shopping.” But before you “shop,” you need a list of what you’re shopping for, avoiding buyer’s remorse that often happens when items are randomly thrown in the cart. Your plan will be developed based on your findings from the user observation studies and your brand audit. Each exercise was approached with an open mind, and the first step of planning should be need-driven, unhindered by any budgetary constraints. However, we are not naïve to the need for budgets, and will address that as well. 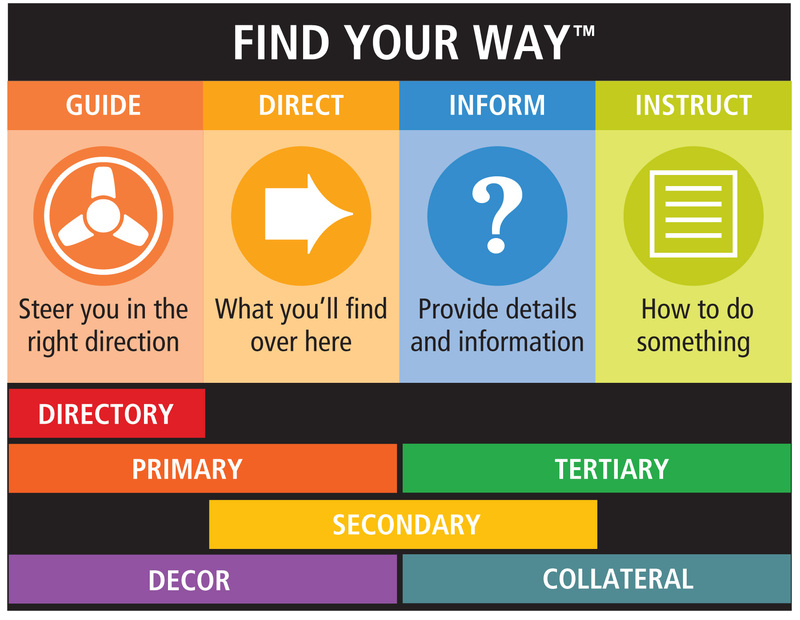 Part 3 of the Wayfinding Series focused on conducting user observations. Referring back to this data and floor plans, you should have identified sign types, decor elements and placement locations. 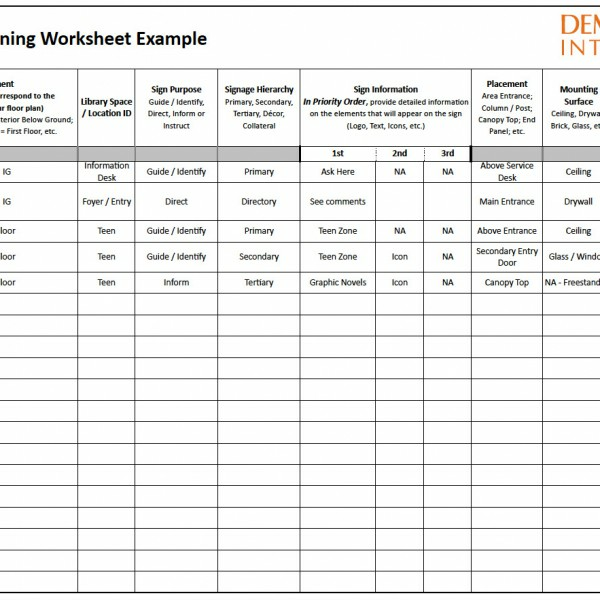 You’re now going to transfer this information onto a Planning Worksheet, detailing it out floor by floor, area by area of your library. Figure 1 is a partially completed example, and guides you through the categories of information. 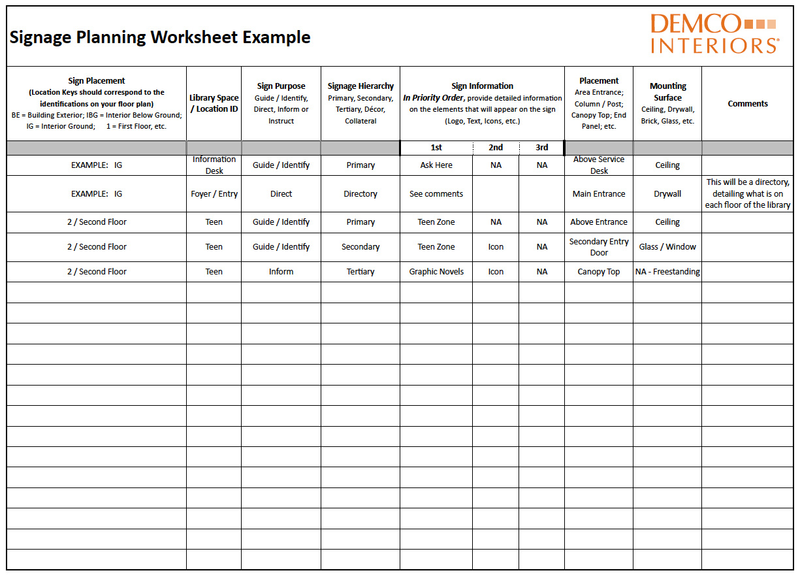 Completing the worksheet gives you a different view of your plan, one that not only allows you to easily quantify signs by type for the entire plan, but also by space within your library. This provides a quick “gut check” to avoid signage overkill and identify any oversights or omissions. You have your shopping list of sign types and the quantity you need, now you’ll bring forth your brand audit insights (Part 2 of the Wayfinding Series). This focuses your shopping on appropriate styles to meet functional needs, met with integrated, brand-influenced selections. There are a myriad of brand-related decisions that influence your selections and how they intersect with your space — design, shape, colors, materials fonts and language, coupled with mounting and/or placement information. This is especially important when using decor elements to reinforce and/or redefine your library’s brand image, and they also function as signage. At this point you may also want or need to procure a budgetary estimate, to see how the plan aligns with your budget. I liken this part to my childhood back-to-school shopping routine of flipping through catalogs, creating my list along with prices, and then having the reality check of my parent’s budget. Some years I was on target, and others I had to make choices, which sometimes meant delaying gratification until the holidays or my birthday. Now is the time to determine your spending priorities and get creative with implementation options if necessary. 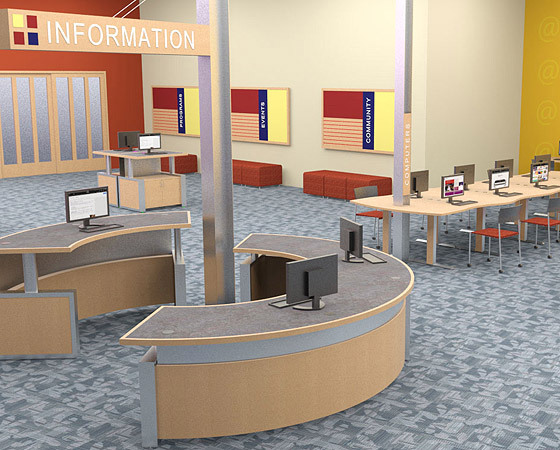 For ideas on how to execute a signage hierarchy that seamlessly integrates within a library space, view this series of renderings utilizing Jennings County Public Library, a Demco Interiors project in Indiana. Walking through the main entrance, you immediately see the Primary / Guiding sign for the Information Desk. A collateral command center uses custom bulletin boards, placed immediately inside the main entrance. From this vantage point, you also se a hint of a main decor element on the far wall. 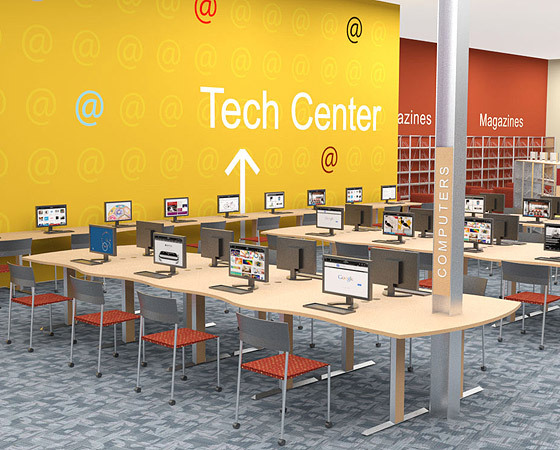 This primary Tech Center sign serves dual purposes of Decor and Primary / Directing signage. Secondary signs are on post to direct users to the computers. A change in wall color and application of typeographic letters serves as Secondary/Directing signage for the magazine collection. Tertiary / Informational canopy top signage identifies featured collections. 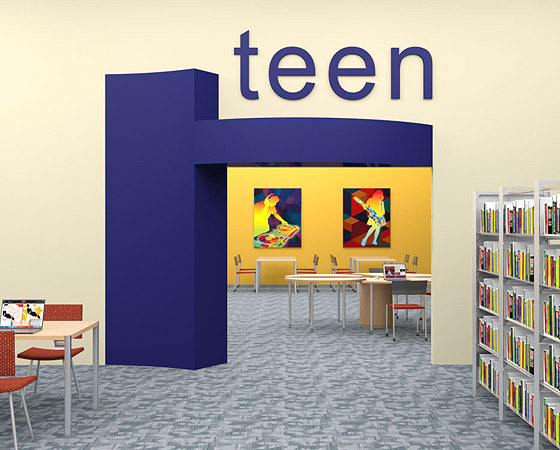 Opposite the main entrance is the Teen Space. The combination of architectural elements, bold color and typographic letters creates highly visible Primary / Guiding signage. In addition, furnishings and interior decor selections reinforce it is a teen space. Consistent style and application of Secondary signs on posts inform visitors on what happens in the space. Tertiary canopy top and end of range signage identifies areas of the collection in this open, air space. 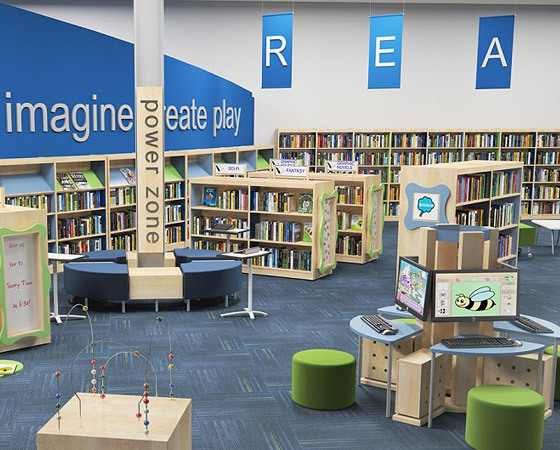 Moving into the Children’s Area of the library, banners and typographic letters are used at a hierarchical size and placement consistent with Primary signage. However, functionally, they are suggesting ideas of what to do in the space, rather than guiding or directing. Other Secondary and Tertiary Signage application is consistent in this area too. 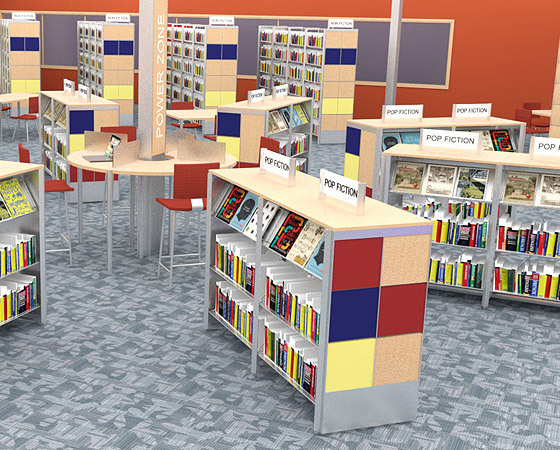 As with the Teen Space, a visual cue is the change in color palette from the main area of the library. This is the fourth of a 4-part series on library wayfinding and signage from Demco. Did you miss any of the previous posts from this series?